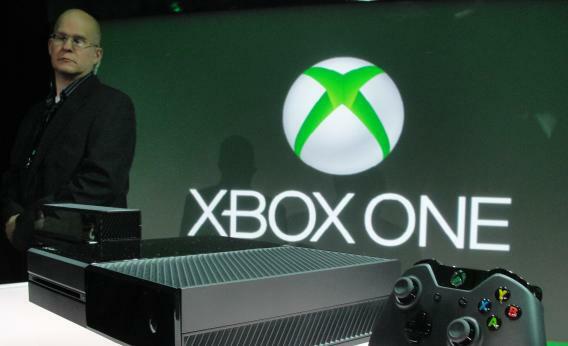 Xbox One release brings complaints about backward compatability, used games. A member of the Microsoft security team watches over the newly unveiled Xbox One. Usually, I have to wait until new video game systems hit the stores to be irritated by them. But I’m already annoyed by Sony’s PlayStation 4, which was unveiled earlier this year, and Microsoft’s Xbox One, which debuted Tuesday. I mean, sure, both consoles offer some things to be excited about. My Slate colleague Farhad Manjoo calls the Xbox One “Steve Jobs’ dream device,” the unit that unites gaming, the Internet, and live TV, still the national pastime. Most impressively, the Xbox One’s voice-recognition capabilities render obsolete the game controller—and even the TV remote. Just as enticing is the One’s built-in camera system, with imaging capabilities so advanced, Xbox will know your heart rate just by looking at you. It all sounds pretty good. But in Internet dens, another story is being told. Self-dubbed hard-core gamers are feverish with rage that Microsoft and Sony are finally doing something about the used-games market that’s been eating their lunch for years. Sony may block used games from the PS4 entirely, and Microsoft is planning to charge an as-yet-undetermined fee to play them. And who wants to pay a surcharge on top of GameStop’s already-outrageous near-retail prices? On this point, at least the nerd rage is misdirected. Used games are heading for obsolescence no matter what. People are increasingly downloading games straight to their consoles, skipping the trip to the store. Instead, let’s direct our collective fury at two things that won’t be moot in the immediate future. Indefensible move No. 1: Neither the PS4 nor the Xbox One has backward compatibility with the games of its immediate ancestors (PlayStation 3 and Xbox 360, respectively)—not even digital purchases made through the PlayStation Network and Xbox Live. Asked about backward compatibility in a Yahoo Live chat on Wednesday, Microsoft honcho Major Nelson said Xbox 360 discs won’t work in the Xbox One because “[g]ames are architected to take full advantage of the state of the art processors and infinite power of the cloud.” Awful corporatespeak aside, he’s a little bit right. The Wii U doesn’t have a slot for Nintendo Entertainment System cartridges. But I thought online services like the PlayStation Network existed in large part so we wouldn’t have to say goodbye to old games. I thought that once I had a dedicated account with Microsoft or Sony, with a username and password tied to my credit card, my purchases would be forever. But no. Tech heads can give me all kinds of excuses about how it would require superhuman feats of programming to make Chrono Cross, a PlayStation One masterpiece that worked great when I downloaded it onto my PlayStation 3, function on the PS4. It might even be true. But from a consumer standpoint, Microsoft and Sony telling me my digital games can’t be played on their new systems is like Apple telling me that the iPhone 6 will be too advanced to play my MP3s. Sony says that it is oh-so-generously looking into ways to let us use the products we bought from its own store. Maybe that will even happen. But no matter what, Microsoft and Sony hope we’ll repurchase favorite games, like how I bought my digital version of Chrono Cross because my discs were so scratched up. My digital copy isn’t shredded, though, so there’s no way I’m buying this game a third time. But that seems to be where the entire industry is headed: Witness Nintendo’s outrageous requirement that Wii U owners cough up extra money to play “Wii U-optimized” versions of games they already bought on the original Wii’s Virtual Console. The Xbox One is making some pretty seductive promises: It will let you play games while Skypeing, watching the NFL, and tracking your fantasy football team, all at once, and all by simple voice command. But it’s a trap! Microsoft is likely to require a $50-a-year Xbox Live Gold subscription for these cool new features. No big surprise: Microsoft already requires an Xbox Live Gold subscription to watch Netflix or Hulu on your Xbox 360. That’s right: a subscription to access your subscriptions. Visions of executives rubbing their hands together have dashed my excitement for the next generation of game consoles. But it’s no use crying over used-games milk. It’s time for us to realize that our childhood dreamweavers have betrayed us, and we shouldn’t reward them for it. Don’t wait in line at midnight for the next big thing—instead, take a look at the $99, Kickstarted Ouya, a new system with an old-school ethos that promises not to pull all the stunts that the big boys do. And until Sony and Microsoft honor our digital purchases, I’m sticking with my Xbox 360, which still runs the download-only gem Spelunky, and my trusty PS3, where Chrono Cross can soothe my own nerd rage.